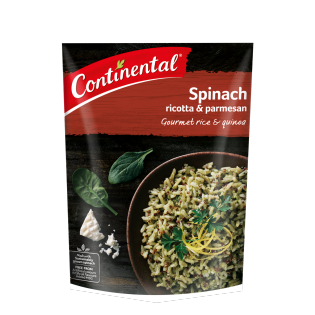 This Spinach Ricotta & Parmesan Rice & Quinoa brings together a perfectly matched flavour combination for a wholesome dish. For a more complete meal, why not add some chicken and steamed veggies, and top with a little extra Parmesan to finish it off! Rice (71%), red quinoa (10%), cheese powders (4%) (ricotta, parmesan), maltodextrin, spinach^ (2.5%) (powder, pieces), salt, corn starch, yeast extract, mineral salt (potassium chloride), garlic powder, onion powder, sunflower oil, herbs (parsley, oregano), black pepper, natural flavour (contains milk). ^From responsibly grown spinach. Contains naturally occurring glutamates. Stove top - for best results 1. Bring 1 cup (250mL) hot water, 1 teaspoon vegetable oil and Rice & Quinoa pack contents to the boil, stirring. 2. Cover and simmer for 10 minutes, until water is absorbed and rice and quinoa are cooked. Remove from heat, stir, replace lid and stand for 2 minutes before serving. Microwave (1000W) – cooking times may vary according to the power and capacity of the microwave . 1. Combine 1¼ cups (310mL) hot water, 1 teaspoon vegetable oil and Rice & Quinoa pack contents in a microwave safe bowl (minimum 1.2 Litre capacity). 2. Cover and cook on HIGH for 8 minutes. Stir, replace cover and stand for 2 minutes before serving. FOR A HEARTIER MEAL ... Just stir through some sliced cooked chicken, chopped Roma tomatoes and top with zested lemon rind and chopped flat leaf parsley. The heartier meal option is just the best, i will now make it all the time. LOVELY VERSATILE RICE WITH GREAT FLAVOUR AND TEXTURE - FAST AND EASY TO PREPARE with no artificial nasties. You can add this to a stir fry for a quick really tasty meal.